Cain was a sent-away son who came to establish his territory "east of Eden" - a phrase which requires a great deal more investigation. Did the Biblical writer intend Eden to be The Promised Land? If so, east would be Mesopotamia, where the Kushite ruler Nimrod ruled. Abraham is a descendant of Nimrod, the son of Kush. What is the Biblical writer assumed that Eden was in Mesopotamia? East of that would place Cain in Pakistan. Perhaps Eden simply means a well-watered region. Ancient human populations settled by lakes and rivers. The phrase "east of Eden" in the Hebrew text is "quimat-Eden" and appears to be an ancient Nilotic reference. Originally, the word was probably qma, and ancient Egyptian word that refers to bulrushes. So it is possible that Cain went to the place of bulrushes, which would be the Nile Valley. In Exodus 2:1-10, we read the story of how Moses; mother hid thee infant in the bulrushes of the Nile. The book of Genesis contains the oldest layers of information about Abraham's Nilo-Saharan ancestors who ruled territories along the Nile when the Sahara was wet (Neolithic Subpluvial). At that time the water systems of the Sahara were larger and largely interconnected. This has been confirmed by geological and hydrological studies of Central Africa and by discovery of proto-Saharan petroglyphs of boats and cows. It has also been attested by the discovery of an 8000 year old black mahogany dugout in Dufuna in the Upper Yobe valley along the Komadugu Guna River in Northern Nigeria. 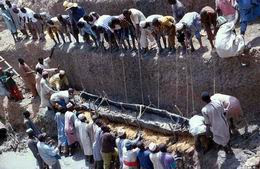 The Dufuna boat (shown above) is about 2500 years older than the oldest known boat in Egypt. The area shaded in red is the location of biblical Eden. It was said to be a well-watered area. Today this is one of the driest regions on earth, but during Noah's time and before it was vastly wetter. Abraham's ancestors came from this region. It is the point of origin of the Habiru (Hebrew) who preserved for us in the Biblical record the traditions, beliefs and practices of their ancestors. Biblical Eden had forests, sustained large herds in the grasslands. Mega-Nile was once comparable in surface area to Lake Michigan (22,394 sq miles) in the US, Lake Tanganyika (12,703 sq miles) in East Africa, and Lake Baikal (12,248 sq miles) in Siberia. Here is the latest information on the vast expanse of the Nile during the last interglacial period. Between 12,000 and 10,000 years ago the Nile filled with waters from the Angolan Highlands. Before this time, the streams of the Ugandan highlands flowed west to join the Congo River, which drains into the Atlantic. Geological uplift about 12,000 years ago tilted the region to create Lake Victoria and direct its excess flow north into the White Nile. The waters of the White Nile provide most of the Nile's water during the dry season. Essentially the entire Albertine Rift was a vast flood plain extending 3,700 miles from Syria to central Mozambique. Likewise, the now dry Botswanan lake basin in southern Africa was once a sea, filled by water from the Angolan Highlands. Thousands of manmade stone tools have been found in the area dating to between 80,000 and 100,000 years. Between 12,000 and 7,000 years ago Lake Chad filled its present drainage basin and spilled southwest out the Benue River to the Atlantic. It was called "Lake Megachad" and during that time it was the world's largest lake with a surface five times larger Lake Superior. Genesis 2:10-14 says that Eden was watered by four rivers: the Tigris, the Euphrates, the Pishon and the Gihon. Two are in Mesopotamia and two are in Africa. This is the place of origin of the ruler-priests and of "him that holds the scepter from the house of Eden" (Amos 1:5). They are "the mighty men of old" who spread across this region. This is the point of origin of the practices associated with the priests of ancient Yisrael/Israel: circumcision, animal sacrifice, two-wife marriage pattern for rulers, sent-away sons, and the Holy Name YHWY. The Ethiopians identify the Gihon with the Abay River, which encircles the former African kingdom of Gojjam (where Ge'ez was spoken, the language of the Ethiopian Orthodox church). The Pishon "flows through the whole land of Havilah" (Gen. 2:11) which was rich in gold. Havilah was a son of Kush (Gen. 10:7) and the "Kushites" lived in the upper Nile region and the Sudan. Kushite kings also ruled in Egypt and were the first to unite the peoples of the Upper and Lower Nile. The description of Eden as a well-watered region is supported by climate and geological studies. These four rivers encompass the heart or Eden of the ancient Afro-Asiatic Dominion which was ruled by a network of chiefs who were priests. They controlled the major water systems and built shrines along the rivers. So my question is then, what do you make of the references to the Tigris and the Euphrates? Are we left with two conflicting traditions in the same story? Or is this really an attempt at some sort of symbolism? I don't see conflicting traditions. Both are Afro-Asiatic and the fact that there are eastern and western Afro-Asiatic traditions supports the claim that Genesis is the story of Abraham's people. If these differences didn't appear, we might suspect corruption of the text, just as a judge suspects collusion when the accounts of 2 witnesses are identical. Both traditions are evident in the Genesis creations stories as well. Both are evident in the details of Noah's flood. In the eastern tradition, Noah sends out a raven. In the western, a dove. There are no ravens in Africa, but many types of doves. The dove that Noah sent out was probably the pink-bellied dove which is plentiful in west central Africa where Noah lived. Thank you for reading faithfully. I hope that this research is spiritually beneficial. May God bless you! Noah would have had both birds on the ark. I am sure that God had a purpose for sending both birds out. Also, the dry land we see today was not the same as the days of Noah. Much topography has changed. The Scripture says that the garden also was "eastward" in Eden and a river went out of Eden and split into four branches as named in the Bible. Some sources think that one river circled the entire Arabian peninsula while another circled the continent of Africa and that the Tigris river went all the way up around England. Interesting theories, but we may never know for sure until the return of Christ. I am sure though, that the truth concerning this (if we could know it now) would satisfy everyone's version. The four rivers ARE identified in Genesis. Two (Tigris and Euphrates) are in Mesopotamia and two (Gihon and PIshon) are in Africa. At the time of the flood - the Holocene Wet Period - these rivers were much bigger than today. And the entire area between them was wet due to geological uplift in central Africa which caused run-off water from the Angolan Heights to flow toward the Nile rather than toward the Atlantic. So the Gihon spring of Jebus/Jerusalem was not the Gihon river of Eden? The Gihon on the west boundary of Eden would have been a tributary of the Upper Nile. It was associated with the land of Ha-vilah, known for gold. Ha-vilah is related to the Hebrew word te-vilah which pertains to immersion in water. Eden was not a small place. It was a vast territory under the control of Afro-Asiatics and their Ha-piru (Ha-biru) ruler-priests. Horus shrines were found widely. These had falcon-shaped fire altars. Fascinating about the drainage changes on the African continent, Alice. The Wikepedia article doesn't really deal with this. Do you have other links that give this geological sequence? Why is it you in the beginning of your paper "Eden: A Well-Watered Region" say: "Abraham is a descendent of Nimrod, the son of Kush when Genesis states that Abra(ha)m is in the blood line of Sem/Arpaksad and not in the Kushite line?